MetalRockNews: Trivium's Matt Heafy: "We've always been into doing the opposite of what we've seen either ourselves doing"
Trivium's Matt Heafy: "We've always been into doing the opposite of what we've seen either ourselves doing"
Trivium's Matt Heafy was recently interviewed by Full Metal Jackie, you can read some excerpts below. Full Metal Jackie: When you're a band with several albums and an established fan base, how much courage does it take to divert at all from what you're known for? Heafy: I think it takes a massive amount, and luckily that is something that we showed really early on. 'Cause there was quite a bit of success with our second album, "Ascendancy", in the U.S. and the U.K., and immediately after, we decided to make a record that was the polar opposite of the previous; we decided to release "The Crusade" right after making "Ascendancy". The reasoning behind that, the reasoning behind consciously making an album that was the… almost polar opposite of the previous is that we wanted to show people early on that we weren't afraid of taking chances, we weren't afraid of doing the opposite of everything we've ever done, and we never wanted to do the same thing that everyone else did. And we noticed that the common ingredient that a lot of bands are always doing is making the same album every single time. So that's something we always tell our fans and our supporters that we are the kind of band that you never know exactly what you're gonna be getting into with each record that follows the previous. Full Metal Jackie: Matt, you've said that seeing Ronnie James Dio with Heaven & Hell really changed you and your bandmates. What affected you so much and how did it change you? Heafy: At the time, I was a casual fan of the Dio material. I'd known the big hits, but I didn't really know much aside from that, or much aside from the "Holy Diver" record. And I definitely wasn't familiar with his Sabbath-era material. So when I saw that set, specifically the song "Heaven And Hell", it showed me how else I wanted to depict the metal that I was creating. Like, the same way that when I heard Metallica, I'd never heard metal in my entire life, I'd never heard metal delivered in that way. And to be able to hear Dio live and be able to hear Tony Iommi live, and to be able to hear how that was portrayed with that band, it really just blew my mind and blew all of our minds. And when we met Dio afterwards, it was pretty life-changing to be able to meet one of the greatest metal singers of all time and be really welcomed by him. He treated us so well and he was very humble and very polite. And it was amazing. It was really like… It was one of those moments where, looking back at it, it doesn't seem real. And after that night, I picked up my guitar and just inevitably started writing something that sounded like the song "Heaven And Hell", I feel. I feel like [the track] "Silence In The Snow", while I wasn't trying to make a song that sounded like ["Heaven And Hell"], the first thing that came out is something that was obviously inspired by the song. Full Metal Jackie: The song "Silence In The Snow" has been around in various forms of completion for quite a few years. Can you talk about the evolution of that track? Heafy: It was pretty crazy, 'cause we wrote that song while we were creating the material for "Shogun". And it was a song that I loved, and I remember our manager loved, and my wife loved. But Paolo [Gregoletto, bass] and Corey [Beaulieu, guitar], they weren't quite into it yet. And we couldn't really figure out exactly why it didn't fit; they couldn't really put exact words on why they were not into it. Looking back at it now, eight years later, I see that we weren't ready for that song. 'Cause that song was the most stripped-back thing that we had written for "Shogun", and "Shogun" was a very intensively technical record. And with the song "Silence In The Snow", it was more minimal. So when a song is more minimal musically, and technicality wise, it relies on a much bigger vocal. And I was an okay singer at that time, but I wasn't where I am now. I'm not saying that I have arrived as a singer, I am not saying I'm at my end result or where I was intending on going in the beginning, but I'm on the path. And I feel like, with growing the vocal range as I have, I've stepped up myself to be the singer that the song required. When the music is boiled down to the simplest part, it's all about the big hook or the rhythm or the big melody, and that's what "Silence In The Snow" is all about, and it just required us to be bigger musicians and bigger performers then we were at that point in time. Full Metal Jackie: You really didn't do the typical social media updates about the progress of this album [2015's "Silence In The Snow"]. How much greater anticipation there's been for the album because of that? Heafy: Just like I mentioned how we've always been into doing the opposite of what we've seen either ourselves doing or other bands are doing, we looked at how are all bands presenting their upcoming records nowadays? And that was, basically, we saw Instagrams or Twitter feeds of just constant pictures of amps or guys sitting in front of computers with a beer, like, "All right, we're finishing our new record," where you're constantly being fed little pieces of information of how the record is going, but never being able to see any finished product until so much later. So we decided to keep the entire thing a secret, which a couple of other bands have done at the same time as well, which I think is cool, when you don't know a band is recording, and then all of a sudden it just comes out. So what we wanted to do is not let anybody hear anything until we had an entirely finished song and an entirely finished video. And we always wanted to present the things differently. We made sure with this record, with every video we did, and with the album art we did, it was all presented in a way that we hadn't presented before, in a way that we haven't really dug into before. So that's why with every single video that's been out so far, with all three videos, they are polar opposites of each other, but they're also very different from everything we've done. Same thing with the artwork being incredibly minimal and simplistic and essentially monochromatic. We wanted to do opposites — do the opposite of what we've done in the past and present things differently. Full Metal Jackie: The drummer affects the dynamic of a band in so many ways. This is Mat Madiro's first album with Trivium. Tell us about his contribution to the disc. 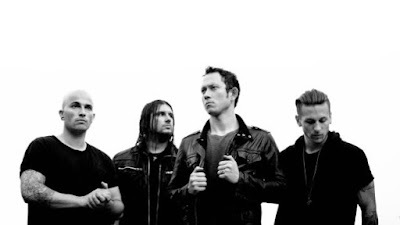 Heafy: For us, the newest member of the band that's formally in the band is Paolo. And Paolo's been in the band for eleven years. So, with our band, whoever is gonna be filling the shoes of the rhythm section of our band has to put in an incredible amount of work and time and effort in order to be where, essentially, the three of us are. So Mat stepped in at an absolutely integral time for our band when we had to make a switch. Basically, we made the switch overnight between Nick [Augusto] and Mat. Whereas when Nick filled in for us, he had about two weeks to learn the material and Mat had 24 hours to learn the material. So Mat came in at a dire moment and came in and saved the day on a tour and did the cycle with us then did the record with us. And it's really up to him to see where his future leads with this band. Like I said, Paolo has put in about ten, eleven years. Corey has been in the band since 2003. I've been in the band since 1999. So we're definitely a band that's been around for a very long time with members who've been in for an extremely large amount of time. So it's entirely up to him to see where we'll go with it. He did a great job on the record, did a great job on the record cycle and touring, and he's doing a great job now. So we'll see.